Coffee Trail - Counting Stars, Reaching Delphi .✫*ﾟ･ﾟ｡.★.*｡･ﾟ✫*. : Sail Me Home Oh Sweet Mama. 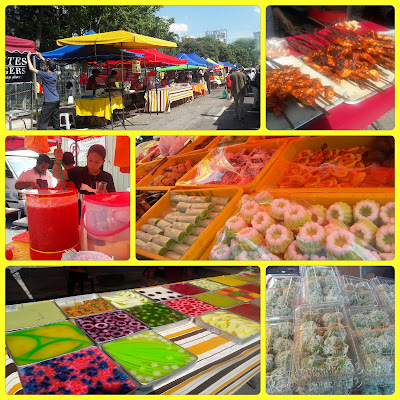 Traffic, crowds, food, and stalls. Some have arrived here early. The smoked-smell of freshly grilled chicken or the Ayam Panggang and Satay linger in the air. The Asr prayers in the background accompany the rest of the traders as they set up their stalls. In the Muslim calendar, this is the holy month of Ramadan. We are at home, in Malaysia. If you are like me and love to explore sweet delicacies, especially the once-a-year rarities, you are heading towards the right direction - to find that bliss, to a Ramadan Bazaar. This is the time of the year when one would always get spoilt for choice of Kuihs (sweet traditional Malay desserts). There are many treats like the fast selling Kuih Pelita (layered coconut and rice flour dessert presented in cute banana leaf based holders), Ondeh-Ondeh (tiny mouth sized green-pandan rice flour balls filled with melted palm sugar wrapped around shredded coconut and a variety of Kuih Lapis (multi-colour layered rice flour cake). These food bazaars are temporary ones permitted by the local Municipal Council for licensed traders or hawkers to carry out small businesses during the Ramadhan month while giving both local visitors and tourist the opportunity to sample a bit of Malaysia during the Muslim fasting month. In Kuala Lumpur, these traders usually operate between 4 pm until just about after the Maghrib prayer, around 7.30-ish. The size of the bazaars varies depending on the location. To maintain and encourage recycling efforts and to ensure the hygiene and quality of the food among the traders, the local councils organise various competitions and conduct regular quality inspections. If you are in the larger cities in Malaysia, you don’t have to go too far in search of a food bazaar. The crowds and traffic backlogs are general indicators that you are closing in on one of them. And if you still haven’t visited one yet, then it’s about time! You may think I am exaggerating when I say this is the best place for Kuih-hunting, but come and see for yourself, you wouldn’t disagree after. The food options are plenty for both vegetarians and non-vegetarians, and they are at affordable prices. I am sure you realise by now I have the softest spot for anything sweet and if you are trying to reach me on the weekend at 4 pm during the Muslim fasting month, try locating me at one of these busy bazaars. Sweetness is infectious and lucky for us it’s is not only in the form of Kuihs but also in the friendly smiles offered in exchange as you pass each stall and in their warm replies as you curiously ask about what each item is and how much they cost. 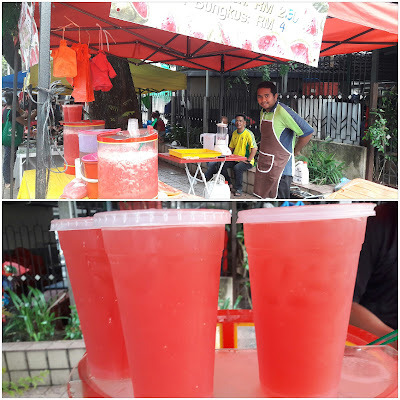 It is also in the generous amount of fruit pieces Atiq cuts up for the watermelon juice; in the young cheerful-spectacled girl at Putrajaya Sentral Station who never fails to keep aside a Kuih Pelita packet even if I almost always arrive after her closing time to pick it up. She may not realise, but with that, I sailed home smoothly. 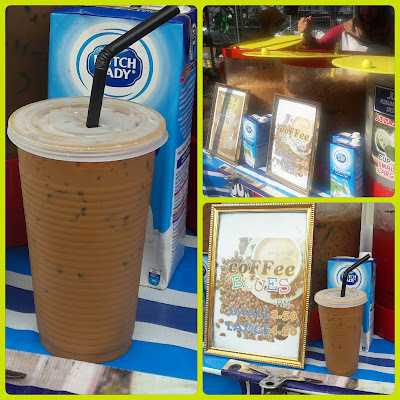 A freezing cold coffee on a hot day is a tempting call. That’s precisely my coffee today. Its origin is unknown, but I learned from the stall operator it’s a local one and that’s all I need for now. I saw her put in 2 large bags of freshly opened ice cubes into the pre-mixed coffee and gave it an even bigger stir until the mixture blended well with the ice. Trust me, mixing those involve a lot of muscle work. According to the Kakak (sister), she had prepared the mixture at her home earlier today. The result is a full strength cold local coffee with a high dose of sugar and condensed milk. I am riding so high on energy now, I feel like I can run a quarter marathon not only this weekend but on every weekend during this Ramadhan month, until we reach the month of Syawal, that’s when our Muslim friends celebrate the Eid or as we call it the Hari Raya Aidil Fitri here. To all readers all over the world, my sincere wish and prayers for peace everywhere. Those stars are not too far within our reach. Have a great fasting week and enjoy your coffee after.